President Barack Obama and Vice President Joe Biden, pictured here in the Oval Office in 2016, reunite as a buddy-cop crime-solving duo in the new (entirely fictional) novel Hope Never Dies. OK, fine, maybe that didn't happen. But it is the plot of a fun new book called Hope Never Dies: An Obama-Biden Mystery, by Andrew Shaffer. It begins with "Uncle Joe" Biden sitting at home when he receives an unexpected visitor. "It's the dark, mysterious arrival of the former best friend," Shaffer says. "And the book is really about two people reconnecting after they've had a little bit of time apart." I tried to get into Obama's head, but you just can't do it. You want it to be so special and magical, and you think there's so much going on in there, and as soon as you start poking around, it just sort of demystifies that and he becomes, you know, just a regular guy. ... But to me, Joe Biden has always been a regular guy. That's part of his own mystique, is that: "Hey I'm just Uncle Joe," "I'm Amtrak Joe." So it was much easier to get into Joe's head. And plus, it fit the noir narration much better to have this grizzled 75-year-old narrator with aviator shades on. You know, I thought about it for years, doing just a book about Joe Biden, noir narrator, because he had those aviator shades on and you could imagine him ... in the vice presidency with nothing to do, sort of daydreaming a Walter-Mitty-like existence through his aviator shades. But that never really got off the ground, and it wasn't until they were out of office for a week that I was like: Oh, well I need to have them together. 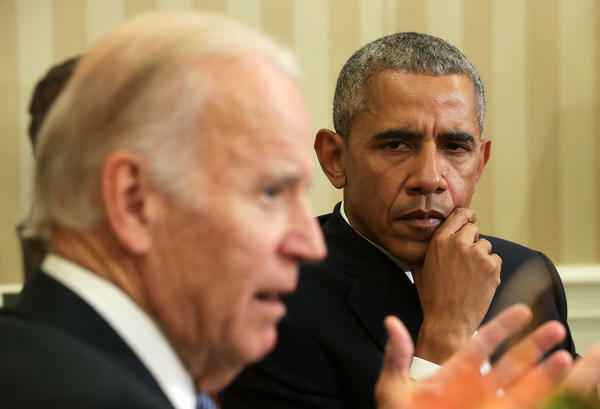 Because those bromance memes had been going around the Internet where it was Joe Biden, like, pulling pranks on the incoming president in the White House and Obama going, "Joe, stop it. Joe." And he really had to have them together, I realized, to have a compelling story. And immediately with them going out of the White House and Obama going on this vacation to end all vacations, people were like: Well, where's Michelle and the kids? And I was like: Well, where's Joe? What happened to Joe? Shaffer: Surely at some point. They don't call him Amtrak Joe for nothing. Gonyea: And there's the point where Obama bursts in carrying a sawed-off shotgun. Maybe that didn't happen either. Shaffer: Right. I can't imagine that ever happening but it's one of those scenes where, you know, you've watched you've watched Obama take, sort of, stuff from every side for eight years. You watched him take stuff from his own side for a while too, in his second term. And so you go — you just want to see this guy cut loose because he never cut loose, except for maybe at the presidential dinners and stuff. But he never really cut loose. Gonyea: You want to see him go full Dirty Harry, at least for that brief moment. Shaffer: Right. He's bluffing in the book, you know — he's not going to actually pull the sawed-off shotgun on anybody. He's certainly bluffing, but at the same time you go: Oh yeah, we're finally getting the Obama without the anger translator that they had on the Jordan Peele show. This is the real Obama — he's showing himself finally. Well you know, we're working on the second book right now, actually. It's called Hope Rides Again and it comes out next summer. And that takes place in Chicago, so that's on Obama's territory, in his adopted hometown. So it's going to be a little bit different but it will still be narrated by Joe Biden, just because we've really set the tone for the series right now. And then some people have asked: Well, I saw that they were together the other day ordering sandwiches, you know — is that going to be in the book? And I said: Well, you know, they might order some sandwiches in the book. You just have to wait and see. Liz Baker and Natalie Friedman Winston produced and edited this interview for broadcast. Patrick Jarenwattananon adapted it for the Web. SHAFFER: Thank you, Don. Transcript provided by NPR, Copyright NPR.